Good afternoon! 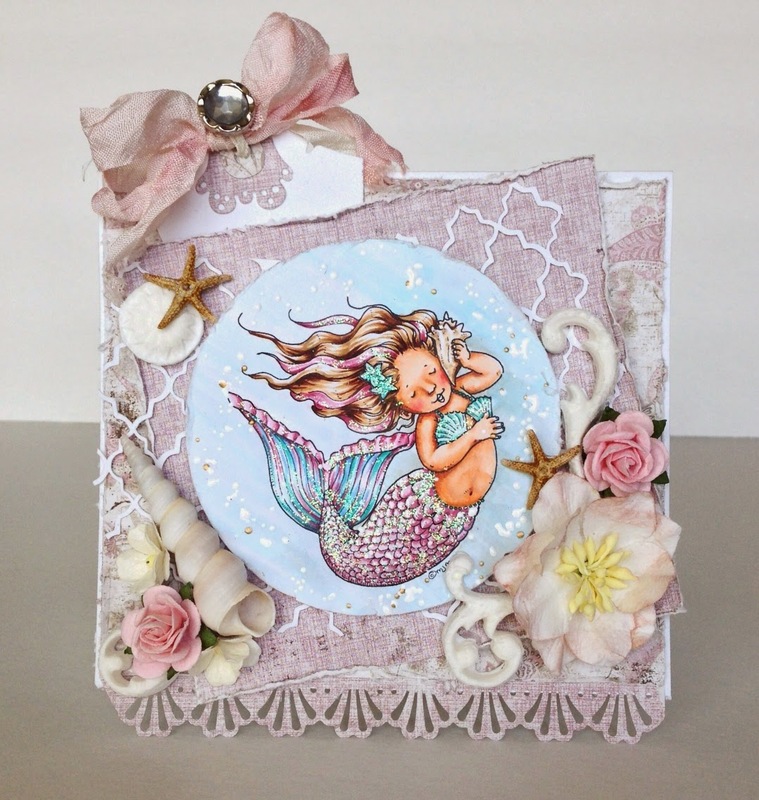 I am back to share a card using sweet Melia on Her Shell Phone, which you can find at Mo's Digital Pencil. I have used some Maja Papers and punched the bottom with a Martha Stewart border punch. I had cut out a mosaic background with my Silhouette and didn't know what to do with it until this card. I thought it made a cute fish net of sorts! I added some flowers and some shells that I snagged from a cousin's wedding centerpieces (Totally allowed!). The molded swirls are from a Martha Stewart mold( I like to think of them as foaming waves... Anyways, I used my all time favorite tag from Magnolia, the Tilda Tag which are still a great deal at Scrapbook Maven. Gorgeous card, what beautiful colours. Thank you right back, Judy! Beautiful work! I too have this little digi, she's so cute & you colored her up so nicely. Thanks for joining us at SACC this week. Good luck. Very gorgeous card. I love papers & image colouring. Thanks for playing with us at Fussy & Fancy challenge. Very pretty card and lovely coloring too. Thanks for joining us at Sweet Pea Stampers and good luck in the drawing!!! love this card!!! the image is beautifully coloured and so many little details to look at!!!! love how you've followed the them with all your embellishments. Thank you for joining our anything goes challenge at Crafty Catz ! This is lovely, her tail is so pretty. And the shells are the perfect accents.